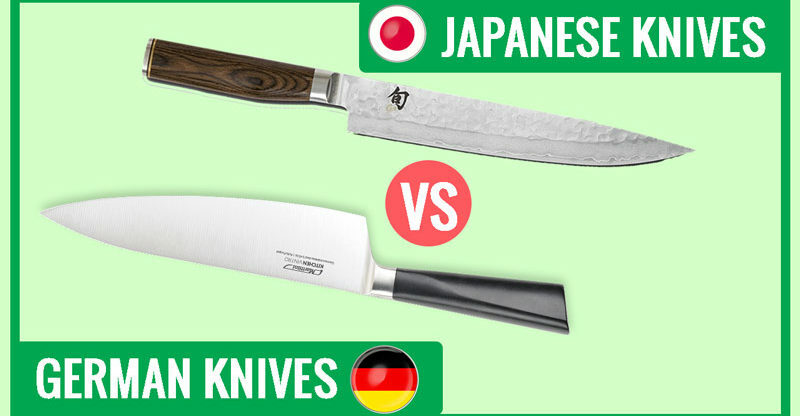 German vs. Japanese Knives: Who Makes the Best? A Chef knife is basically an extension of a chef’s arm. This is the number one tool within a chef’s arsenal so there is no wonder why they would want the best of the best. In choosing your knife, there is only one comparison that stands out: German vs. Japanese knives. Without contest, German and Japanese knives have always been the best makes. But who makes the best? The answer, that can vary from chef to chef depending on what they want out of a knife. Different factors such as durability, sharpness of the edge and overall strength of the blade will determine which knife they choose. Knowing what the knife will be used for will also play a major role in the selection process. Will the knife be used to make precise and limited cuts during service? Or will it be utilized to prep food all day long using a number of different techniques and varied cuts? Let's take a deep look. Japan has been making knives for thousands of years and these typically resemble samurai swords and katanas. The look of the knives made there are clean and sleek and are structured to make incredibly precise cuts. Some of the Japanese knives will have a design etched into the blade to honor the knife maker since they are made by hand. Others will have the look of Damascus steel, which is steel that has been pressed several times over to not only make the blade stronger but also reveal an awesome design on the blade. Damascus steel is very rare to come by and is very expensive since it only comes from one place in the world, Damascus. This is what the design on most Japanese blades is called. However, that does not mean that it is Damascus steel, the designed can be mocked. Japanese made knives tend to have a higher carbon content within the steel which makes the blade much stronger. It also allows the blade to become much thinner and lightweight. This is why the blade retention surpasses that of German made knives. But it does mean that they are more prone to chipping and may be easily damaged if not used properly or dropped on the ground. Japanese blades taper off in the handle as well. This creates a heavier front end of the knife which makes it much easier to control when moving back and forth. The edge of the Japanese blade is only sharpened on one side as opposed to both sides which also creates a sharper edge. The handle is also a cylindrical shape as opposed to a handle that will fit your hand for a more ergonomic effect. These knives are not necessarily meant to be used for long periods of time which is why the handle is created that way. It also helps to balance the weight of the knife evenly. The most reputable knife maker in Japan is called “Shun”. They make some of the best knife sets in the world. Click here to take a look at the best high end Japanese knife sets available on the market today! Germany makes great products and, in most cases, they make even better products. German products are engineered to last longer. The same goes with their knife manufacturing. The steel used in German knives has a lower carbon content which makes the metal softer. This allows the knife to actually be stronger. The knives tend to be able to hold up to just about anything when it comes to durability. They have the ability to cut through bones, hard vegetables and ice without breaking or chipping. In the worst-case scenario, they might leave a divot or dull the blade. The softer steel allows the blade to be sharpened much easier than that of a blade with a high carbon content. However, the blade does not hold its edge as well and will need to be sharpened quite often. German knives are designed to be used all day and then some. The handle usually has an ergonomic shape to fit your hand for easier cutting and chopping throughout the day. The blade also has a full tang and is triple riveted to ensure the durability of the knife once more. This does make the knife much heavier but that is the reason why they last so long. There are many companies in Germany that make great knives but the most commonly known would be “Wusthof”. They have been making knives longer than anyone else in Germany and have the record to prove it. Check some of the best high end knife sets available on the market today! What is the Best Knife? Well, to put it simply, it all depends on the user. These knives are designed to handle different purposes for a reason and that is not only what sets them apart from every other knife on the market but also makes them the most trusted and used knives in the kitchen. German vs. Japanese knives, which to choose? If you want a chef knife that is lightweight, incredibly sharp and able to make clean and precise cuts every time then you will most likely want to purchase a Japanese made knife. As long as you handle the knife properly, don’t drop it and take extra good care of it then the knife should last a lifetime. And if it doesn’t last a lifetime, then send it back and in most cases they will either repair the blade or replace it free of charge! However, if you are looking to do a lot of cutting and prepping, utilizing several different cuts and techniques then you would want to purchase a German made knife. They are basically the workhorse of knives and are meant to last forever. They can literally take a beating and then come back for more. In the off-chance your German made knife gets damaged, make sure you purchase one with a lifetime warranty so you are able to send it back to be replaced as well. 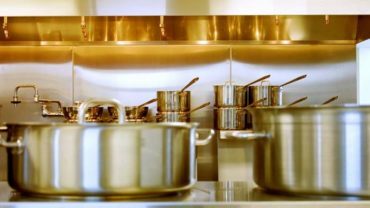 10 Best Cookware Material For Health. Go Yummy! Go Healthy!